In February 2014, I took advantage of Steinberg's upgrade pricing to buy the Absolute VST Instrument Collection and HALion 5 . (If you already own a recent version of Cubase Pro or Cubase Artist , you get a discount on the VST collection, and if you already own the VST collection, you can get a discount on HALion 5.) These download-only upgrades were attractively priced, but I had some significant issues with both products once they were installed, and it took a fair amount of time to troubleshoot and fix them. Here's a rundown of the issues I had, and what I had to do to get things working properly. After you order these upgrades from the Steinberg Shop and Steinberg processes your payment, you receive an Order Confirmation email from the Steinberg Online Shop that contains the activation code and download link for your product. The link goes to the download page of the Steinberg Shop and requires you to sign in with your Steinberg Shop credentials. These may be different from what you use to log in to your My Steinberg account. This is really important to know, because if you happen to lose your email, you may be startled to find that unlike other Steinberg software you may own, you won't find installers for HALion 5 or the VST Instrument Collection listed either on the main Steinberg Downloads page or the Downloads tab of your MySteinberg account. I am very familiar with Steinberg's software product line and many of the installation-related issues people commonly encounter with their products. Some of the most popular articles on this blog are about how to restore VST presets for a number of Cubase plugins, for example. But I was really stumped by this problem for several days. 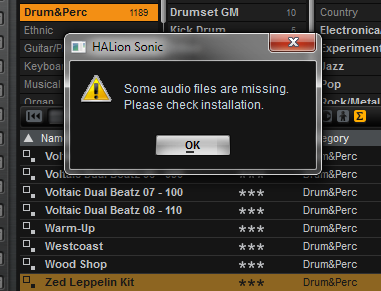 Basically, once I had installed both Absolute VST Instrument Collection and HALion 5, I found that a large number of the presets wouldn't load due to missing sample files. In HALion Sonic 2, frequently when I attempted to load a patch I'd be greeted with an error message that said, "Some audio files are missing. Please check installation." With the same patches that didn't work in HALion Sonic, HALion 5 would display errors that said: "Missing sound archive (double click to register)." Sometimes a problem patch would appear to load (I wouldn't be prompted with an error message), but no sound would come out when I tried to audition the patch. Here are the names of some specific patches I had problems with, but there were many others: 12 String Acoustic, Xylophone, Zed Leppelin Kit. I am very familiar with Steinberg's software products, and I spent a couple of days scanning my hard drive for extra VSTSOUND files and importing them into HALion's library, but it did no good. I was simply missing a whole lot of content. Download the ISO files for the product you need to re-install. I do not think these are secret links, so I am providing the ones that Steinberg Support sent me here. If the links don't work, you will have to create a support request in your MySteinberg account and request new links. Absolute VST Instrument Collection disc. You have a choice of either burning disc images from the ISOs or mounting them directly using a third-party utility when it is time to install. I used the free tool SlySoft Virtual CloneDrive. Go to the Programs and Features control panel on Windows and uninstall the existing product(s). You might actually have to uninstall a lot of stuff to completely remove Absolute VST Instrument Collection. I found it helpful to sort the list of programs by Installed On, and I just uninstalled every Steinberg product from that day. Using discs you made from the ISO images, or by mounting/unmounting the ISO files as needed with a virtual drive program, install your products again. Even after I had uninstalled all my old software (and even rebooted my computer), when I ran the installers from the ISOs, the setup programs seemed to think some of the content was already on my computer. For all of these options, I manually selected the item in question and chose Reinstall to make sure that all of the correct content actually did get copied to my system. 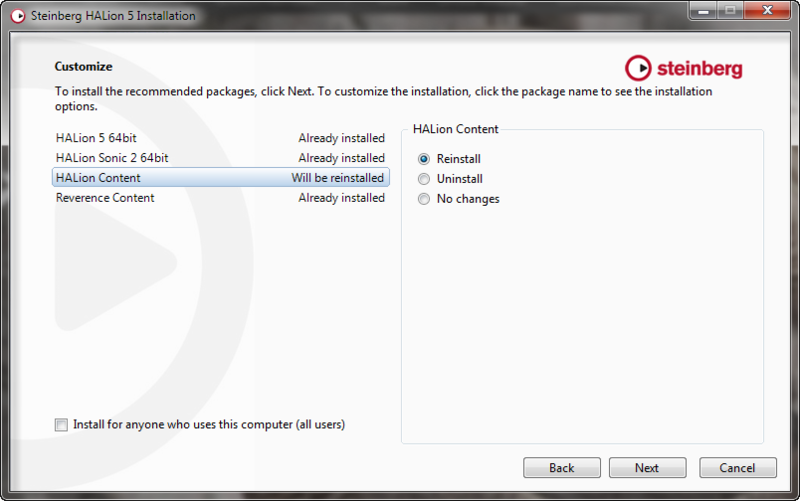 Below you can see that I had to choose HALion Content and select Reinstall when re-installing Halion 5. Do not exit if you see this animation. Quit the application once the library's finished importing and repeat step 6 for the other product if you have both HALion Sonic and HALion 5. While the versions of Steinberg plugins that ship with Cubase are often designed to only work inside of Cubase or Nuendo, the standalone VST packages Steinberg sells at the online shop are designed to work with third-party DAWs with VST support, including Ableton Live . When I first launched my copy of Ableton Live 9 Suite , neither HALion 5 nor HALion Sonic appeared in Live's Plug-ins browser. I quickly realized why: Neither of the installers for HALion 5 or the Absolute VST Instrument Collection had prompted me for an install directory, so their plugins must have been placed in a default location outside of the VST Plug-in Custom Folder specified in Live's Preferences > File / Folder tab. The Absolute VST Collection is a bundle of individual products, so here are all the folders I found in the default location: Dark Planet, HALion 5, HALion Sonic, Hypnotic Dance, Padshop, Retrologue, and Triebwerk. I moved all of these folders to the VST Plug-in Custom Folder specified in my Live preferences. (In my case that was C:\Program Files\Vstplugins. After re-starting Ableton Live, I was now able to use all of my Steinberg plugins. Note: At this time Ableton Live only supports VST 2.x plugins, and those are the ones described above. The current versions of all Steinberg VST products also install VST 3.x versions under the Common Files\VST3\Steinberg folder in your Program Files directory. 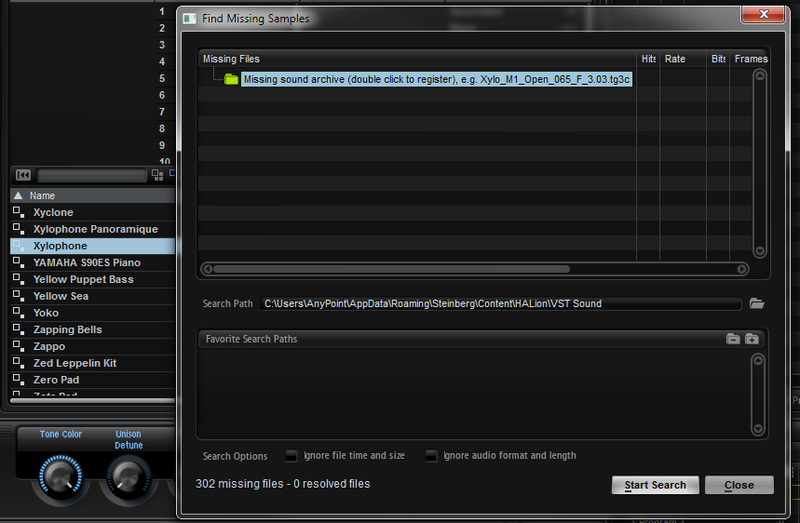 These files end with a VST3 filename extension, and you shouldn't move those.